School is almost out! 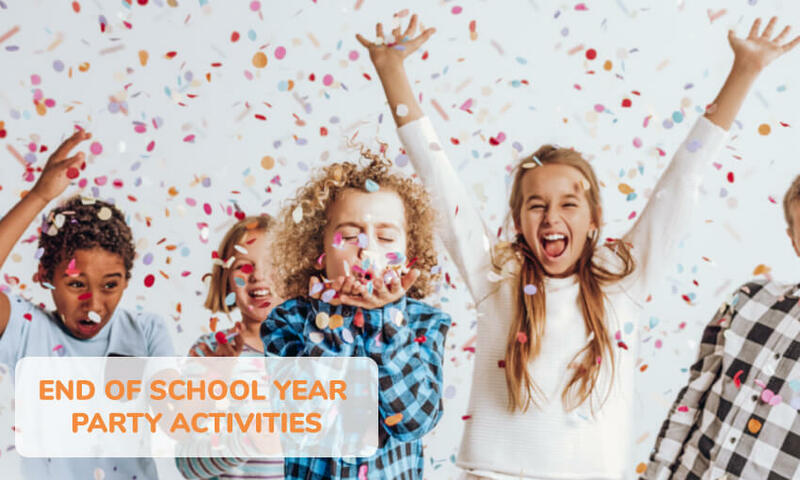 Here are some fun end of school year activities. An “End-of-the-Year event” or “End Of Year Party” may seem unimportant, however it is a VERY IMPORTANT activity. It’s the end of the school year! The CLOSURE cements the experience of the year, and positive memories have an effect on the children’s attitude. In this category are ideas for display boards, games, literacy, treats, feel good, and just plain fun! This is a time to look back and reflect –as well as a time to think ahead. Additionally, be sure to recognize your graduating youth–both grade school and middle school– in some way! 1. Do a compare and contrast of the two books. 2. Then have the children draw pictures of the things they would like to say “goodbye to” in your room. 3. It’s good “therapy” because we know how hard it can be to say goodbye to our familiar room and friends. When complete… bind it into a program book titled ‘GOODBYE ROOM’. Blow up a picture (or draw one) of one of your staff members…Make/cut mustaches out of black construction paper. Place tape on the back of each mustache. Then the game proceeds just like ‘Pin the Tail on the Donkey’. IDEA: You could also get permission from the school principal (or a favorite school person) and pin the mustache on a picture of them! 3. Grade 3 (Or__________ ) HAS BEEN A BALL! This is a fun and different way to have an autograph party as a remembrance of the time spent in child care program or class. Beach balls are fairly inexpensive–order some from a novelty company-have children blow them up and then get autographs from each other on the balls! 4. MAKE TIN CAN ICE-CREAM! Mix the ingredients in the small coffee can and cover with a tight-fitting lid. Tape the lid on the can securely with strapping tape. Place the “filled” small coffee can inside the large coffee can. Pack the large can with crushed ice around the smaller can. Pour at least 3/4 cup of rock salt evenly over the ice. Place the lid on the large coffee can and tape securely with strapping tape. Roll the can back and forth for ten minutes. Then open the outer can. Remove the inner can. Remove the lid and stir the mixture with a rubber spatula. Scrape the insides of the can. Do not allow mixture to become liquid. Replace the lid on the small can. Tape securely again. Drain the ice water from the larger can. Insert the small filled can. Pack it with more ice and salt. Roll it back and forth for five more minutes. Enjoy! This recipe makes about 3 cups of ice cream. Teachers/caregivers might adapt the recipe, depending on the size of the group or whether they want small groups of students to make their own batches. 5. DO SOMETHING FUN SUCH AS… AN EGG DROP! Send students rolling into the next year by making grade-number-shaped soft pretzels. When it is ready, cut the dough into small pieces and give one to each child. Have students stretch and roll the pieces into long ropes, then shape into the number representing next year’s grade. As the pretzels bake, invite the group to talk about favorite moments of the past year, and to speculate on what next year will bring. Give teachers, office staff, and others a special thanks by inviting them in to your program pretzel celebration. 1. In a large bowl, soften yeast in water for 10 minutes. Add salt, sugar and butter. Mix in flour until a dough forms. Knead the dough for 5 minutes and set aside for 1 hour. 2. Preheat oven to 450 degrees. With a knife, cut dough into small pieces. Roll each piece into pencil-thin ropes and shape into pretzels. Spray a cookie sheet with PAM type product. 3. Place pretzels onto sprayed cookie sheet. Brush with egg mixture and sprinkle coarse salt on top. Bake for 12 minutes. SOFT PRETZELS USING FROZEN BREAD DOUGH! Separate thawed bread into 24 – 1 1/2″ balls. Roll each ball into a rope 14 1/2″ long. Have children plan and design pretzel shapes (letters or numerals). These are nice any time of then year–but especially nice for the end of the school year! Give kids lengths of string, yarn or embroidery floss. If these are new to your group…demonstrate how to braid the string together to create a friendship bracelet–have kids make their own design and add beads if desired. FYI: Friendship bracelets made for friends should be tied on by the friend if possible to an arm or on an ankle and worn until it falls off naturally. Threads commonly used are floss and will wear in time. There are some friendship bracelets made for wishing wishes, those are fun but tend to be thinner as the ‘friends’ like them to fall off faster so that the wish can come true. 1. Have each child bring a pre-washed white shirt to school on one of the last days of the year. 2. Paint each child’s hand with bright-colored paint; then have them press their handprint onto the T-shirt. 3. Have children sign their names under their handprints. 4. Last, have them collect autographs from their friends using thick, pointy-tipped, permanent black markers to sign the T-shirts. 5. You could also just write the grade and year on the front or back of the t-shirt and have all students sign the shirt—and perhaps add a personal touch with a favorite saying or drawing. Donna Thomas, a teacher at Heritage Prep Middle School in Orlando, Florida has said, I still hear comments from the children; they say things like ‘I remember all my friends from first grade, even the ones who’ve moved away, because their names are on the shirt. At your end-of-year party, give each child a slip of paper and invite him or her to write one goal for the future. Have students slip the notes inside balloons and then inflate them. Later, have kids toss balloons (like graduation caps), keeping one to pop and share its (anonymously) written message aloud –with the rest of the group. 2. Each person is given a marker. 3. Each person in the group must walk around the room and write a compliment or positive remark about that person on their back….. NO PEEKING! 4. When everyone has written something positive on each others back, they return to their seat and read what was written. This is a great self-esteem booster for kids! If some children still don’t know each other very well…they can write such things as: You have a great smile; You’re hair always looks nice; Great blue eyes; etc. Consider having children write letters introducing themselves to the classroom teachers they will have NEXT year. Student letters might include information about themselves, their families, their hobbies and interests, their strengths and weaknesses in school, and so on. That way, teachers can start the new school year knowing a little something about their new students. When school starts, you can find out the children’s teachers and deliver the letters. Also doesn’t hurt to ‘build some bridges’ with the school community! If you will be leaving a position as the “site director”—and a “new director” that does NOT know the children will be taking over–be sure to do this. It will be beneficial to both the children and the new supervisor! To make it easier for the kids, you could also put together a form letter where they just fill in the blanks! At the end of the year have each child make an autograph book. They pass around their books and get everyone’s signatures and notes for a summer keepsake. Whip together 8 ounces of softened cream cheese and 1/4 cup of seedless strawberry or raspberry jam. 1. Place a miniature peanut butter cup–bottom up on a plate. 2. Top with a small dollop of frosting or peanut butter and then press on a chocolate-covered graham cracker. 3. For a tassel, tightly roll up a small square of fruit leather. Cut fringe on one end and attach the other end to the center of the graham cracker with another dab of frosting or peanut butter. IDEA: THEMES ARE A GREAT WAY TO CULMINATE THE SCHOOL YEAR! (Actually, themes are wonderful ANY time) Example is adapted from Lori Eisner in Florida… Her last week of school is Caribbean/Ocean week. Children imagine they are all on a CRUISE SHIP leaving from MIAMI, FLORIDA ON MONDAY and sailing to different islands. Kids make/wear a white T-shirt that says, “Aloha ______ 2013” with a hibiscus drawn on the front and the autographs of children on the back. THE FOLLOWING NEED TO BE STARTED AT THE BEGINNING of the school year–in preparation for the end of the year! 16. Start a special journal for each graduating student. Throughout the year, teachers, parents, community members, peers, and others can write messages to the students in the journals; you can also include activity photographs. Give the journals to the students at an end of the year family event –or your ‘End-of-the Year’ party! Working on these throughout the year, will provide a wonderful keepsake for your graduating youth. Instead of presenting a journal to the students, have students record their thoughts in a journal during the school year: Things for which they are thankful. Present the journal to their parents at the end of the year. 17. IDEA: TAKE PHOTOGRAPHS DURING THE YEAR and put together a slide show. 1. Of course you can show this as PART OF A YEAR-END FAMILY EVENT—but it would also be a wonderful “WELCOME AND INTRODUCTION to the new children you will have the next school year. 2. You could use it to show children and families some of the things you do-how they’re done–and what to expect! If you haven’t started, get your slides, videos, and activity scrapbooks going now! Children can create individual scrapbooks with pictures, favorite sayings, stories and art work saved during the year! TWO ‘LEAVING ELEMENTARY SCHOOL’ IDEAS! At the end of the school year, have students write themselves a letter. Tell them that no one but they will read this letter so they can say anything they want in it. However, part of that letter might include who their friends are, their current height and weight, favorite movies and music, and special things both good and bad that occurred during the year. Encourage youth to also include a current picture. What would they like to accomplish by this time next year (or sooner). Students seal this letter in an envelope, self-address it, and give it to you. In a year (or sooner) mail (or return in person) the letters to the students. The directions are slightly different for eighth-graders. Ask them to write ten goals they would like to accomplish by the end of the next four years. They seal these, self-address them, and give them to you. Mail those letters back to them at the beginning of their senior year. Original directions for this activity say to mail at the end of their Senior year; however mailing them sooner will remind youth of their goals. They still have a year left! Current graduating kids might create a handbook full of advice for the next group of “new to the program or school” kids. They could contribute pages to a single handbook, or brainstorm a list of helpful tips and information; this could be used to create mini handbooks. The hand-books could be given out to new families with your “Welcome to our Program (or School)” packet! Shoe Mix-Up: Have children take off their shoes and mix up the whole pile; have them race to put the shoes back on. Sock Throw: Put a tennis ball into a long sock and have kids throw it to see who can throw it the furthest! 1. Stuff a small paper bag with newspaper. 2. Tie it off with a 12″ long string. 3. Hold the end of the string. Spin around 3 times. Let go. 4. Watch how far the hammer travels. Record distances. The longest distance wins. 1. Tape 4 straws together end to end. 2. Mark a starting line behind which all players must stand. 3. Place a wastepaper basket 5 feet from the starting line. 4. Throw straws into the wastebasket. 5. Give each player 5 turns. 6. The winner is the child who gets the straws into the basket the most times. 1. Mark a starting line with tape. 2. Start with the toes behind the line. 3. Take one giant step. 5. The winner is the one who took the biggest step. 1. Make a ball out of aluminum foil. 2. Hold the ball in the palm of one hand. 3. Instruct children to place that hand next to their ear and then push the shot into the air extending their arms. 4. They can not move their feet. Record distances; the longest distance wins. 2. Tape two heavy foam plates together. Hold the “discus” like a flying disk. Throw away from the waist. 1. You can have competitions involving pairs and singles. 2. You will need a judge to determine if shots are in or out in the event there is a question. 3. Keep scores for each of the teams competing. 4. Use the official badminton rules or make your own that are consistent for every team. 1. Set goals at least 15 feet apart. Goals can be as simple as a rope anchored in the ground. 2. Play the best two out of three games. 3. Keep scores for medals and prizes. How aboutthe games played in ‘Summer Olympic Games’ such as:SOFTBALL, FOOTBALL, BASKETBALL, HANDBALL, HOCKEY, TENNIS OR VOLLEYBALL? They’re all Summer Olympic Games!!! The last week of school can often go into extremely hot days… During that week, hold a Water Fun themed day! Have the children bring their swimsuits and towels to school and outside for an hour or two and take part in a variety of “water” stations. (Similar to a day of Field activities). Obstacle course: (Go through a sprinkler, over hurdles, through tires, etc. This wouldn’t be too difficult or expensive to do! …All in a cup filled with love and a kiss. Put all items in a paper cup with a Hershey’s Kiss–wrap it up with cellophane and tie with raffia, yarn, or ribbon. I give you back your child ~ the same child you confidently entrusted to my care last fall. I give him/her back pounds heavier, inches taller, months wiser, more responsible, and more mature then he was then. Ten years from now if we met on the street, we’ll feel the bond of understanding once more, this bond we feel today. We have lived, laughed, played, studied, learned, and enriched our lives together this year. I wish it could go on indefinitely, but give him/back I must. Take care of him, (or her) for he (she) is precious. I’ll always be interested in your child and his destiny, wherever he goes, whatever he does, whoever he becomes. Get creative! Make up some fun and unique awards for your students. Find something unique about EACH CHILD and recognize them for that unique quality. You can purchase award certificates at your local teacher supply store. You may also want to create them yourself on a PC or download a template from the internet. PUT IT ON THE ‘WALL 0R DISPLAY BOARD’ SUGGESTIONS! On a nice day–take this activity outside! As an extension, you can have your group write about the favorite memories they drew. Be sure to post these in your ‘Information Center’; include it in your current year’s scrapbook! BONUS! The board is up and ready to go during the first week of school! Remove what is currently on your Board such as art projects, etc. LEAVE UP Bulletin Board Backgrounds and Borders. During the week BEFORE the last week of school, ask a talented student artist (or do this yourself!) to block letter the words: “HAVE A GREAT SUMMER!” on your bulletin board background paper. As the days get closer to the end, have youth autograph and write messages on the bulletin board paper. Leave their NAMES AND MESSAGES up for everyone to appreciate. When you return for the new school year you’ll be starting off with one area already decorated with POSSITIVE MESSAGES! The kids will like reading what they and others left a couple months back! 29. IDEA: HIGH FIVES FOR SUMMER! Put up plain colored background, a border of your choice, and the title; “High Fives for Summer”! 1. In a color of their choice–have children trace their hand onto a piece of construction paper. 2. Have them cut out their hand shapes. 3. Next give each child a piece of white lined paper (that will fit on the palm of the hand) and have them glue it onto their hand shape. 4. Instruct the kids to write their summer plans on the white paper on the palm. 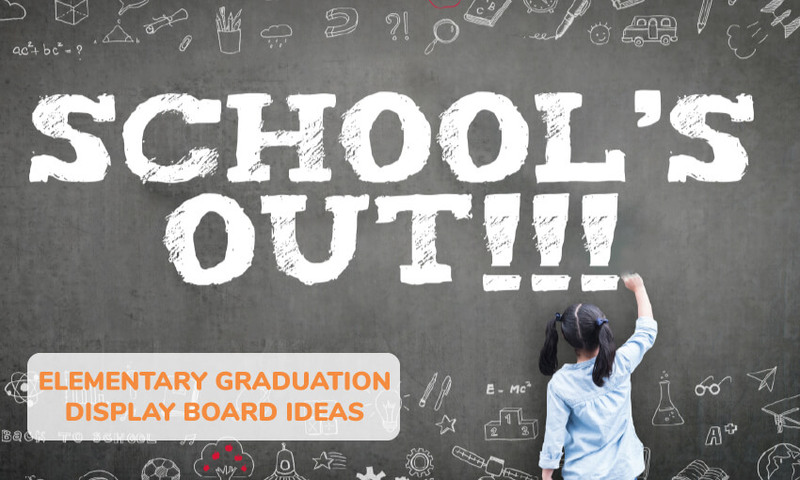 Put up the caption in big letters on your bulletin board or butcher paper taped to the wall— and then have children “decorate” it by writing things that they enjoyed doing in your program the past year! 31. IDEA–FAMOUS LAST WORDS: The Wall of Wisdom! Before kids leave for the summer, invite them to leave behind some words of wisdom. Tape the bricks on a bulletin board to make a wall. At the beginning of the year, share these “famous last words” with your new group in the fall. It’s also a great way for the children to REVIEW rules and expectations WITHOUT YOU going into lecture mode. Indicate which “bricks” belong to your graduating 5th or 6th graders–their “words of wisdom” often come from a place of much experience! We have to say “so long”. Invite kids to come dressed up in clothing that REPRESENTS a job that interests them. 1. Have students research their chosen profession and report to the group—and/or make posters depicting their chosen occupation. 2. Just thinking of things they can wear, design, and make could take up a portion of the week!!! 3. Take pictures of the event to add to your program scrapbook and for kids to take home. 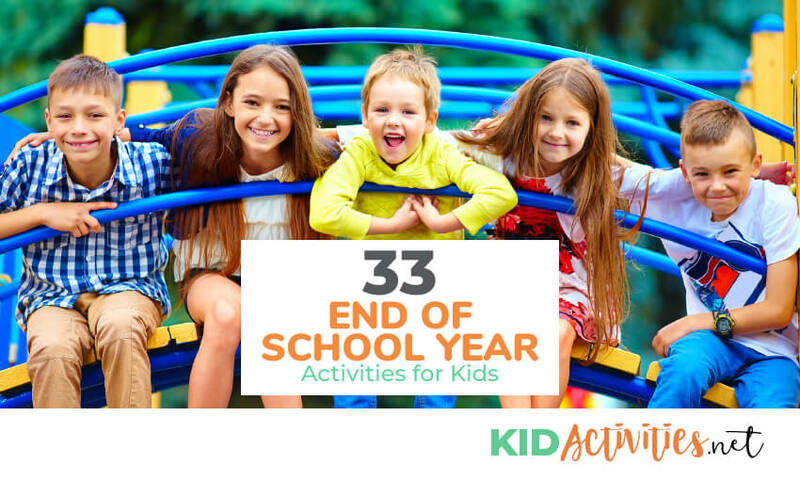 There you have it, 33 fun end of school activities and end of year party games. We hope they h ave inspired you and help you send the kids off well. 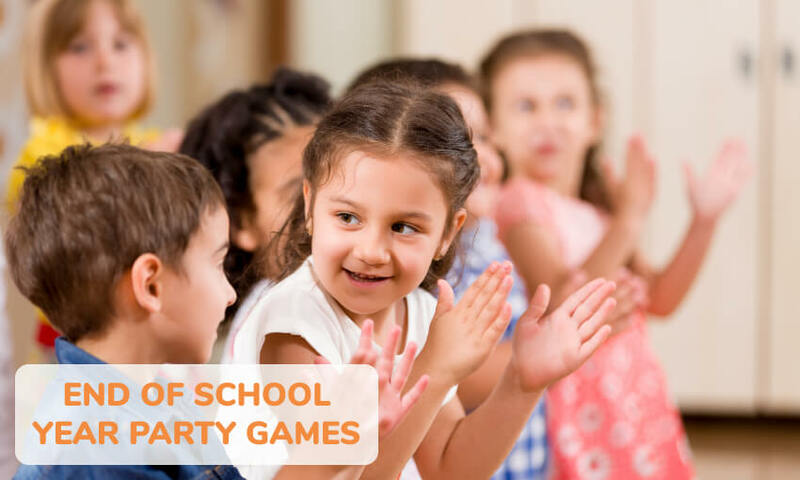 You may also be interested in Social Event Ideas/Activities for School and Child Care Programs!